Kayaking near West Street Hotel. 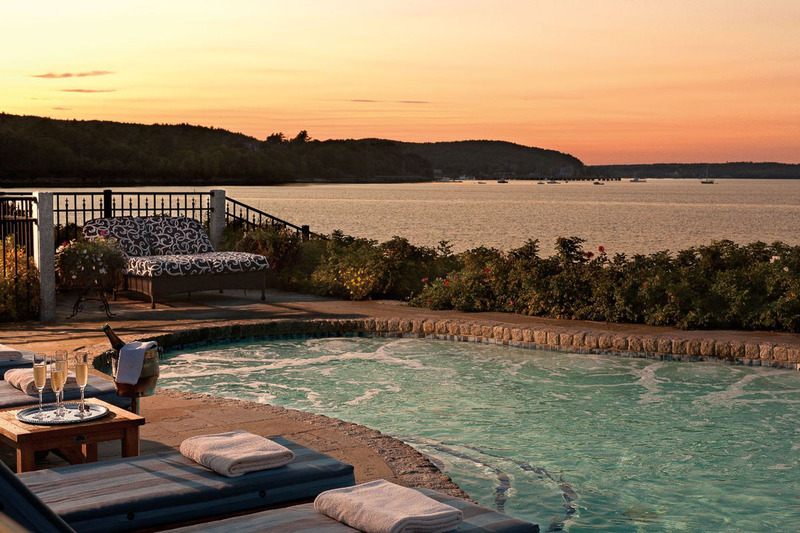 All photos courtesy of Ocean Properties, Ltd.
There’s nothing like the coast of Maine in the summertime. And there’s no better place to spend the day than Acadia National Park, just outside your lobster-ific base in Bar Harbor. 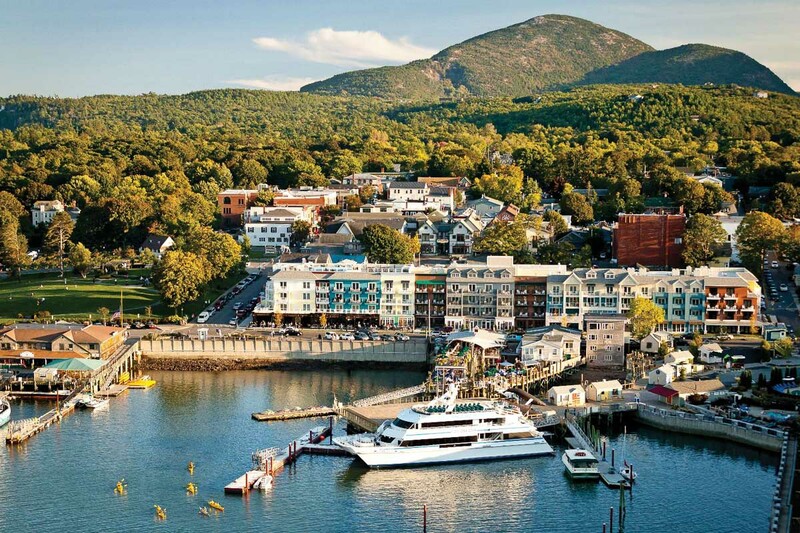 BAR HARBOR, Maine – For years, my family and I had two associations with Acadia National Park. The first, a brilliant, life-affirming sunrise over Cadillac Mountain. The second, a death-defying sea kayaking expedition that left us all awed by the power of the Atlantic — and more than a little bit green with seasickness. As an adult, I've visited a few times and been reminded how spectacular it is, and how I should pace my lobster consumption when I'm there. A little bump on a map off the southern coast of Maine, Acadia National Park is a two-lobed jewel in the American crown. Dual harbors, configured like a pair of lungs, occupy an island that’s at once beach, spruce forests, and (several) mountains. 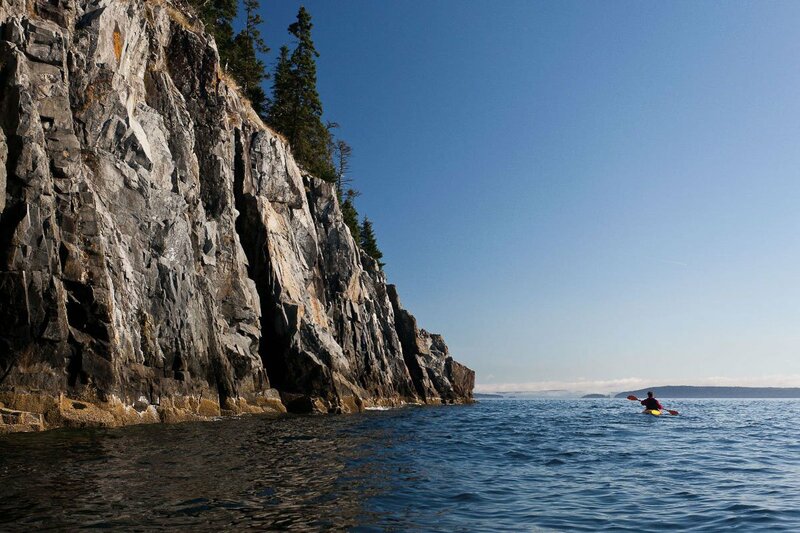 Thus the name: Mount Desert Island, which forms the home of the park and hosts a stream of warm-weather nature lovers. …it would be a shame. But if you’re really only there for a short time, drive the park’s 27-mile scenic loop. Beginning at the Hulls Cove Visitor Center, the route hugs the rocky coast and takes you past Sand Beach (a great place to stop, stretch your legs, and stroll along the sea), to Thunder Hole (where you could park and wait for a crashing wave), into Jordan Pond (where I highly recommend stopping to snack), and back north toward Cadillac Mountain. It’s a quick, pretty drive, particularly if you go in the morning (before 10 a.m.) or late afternoon. >A view of the West Street Hotel. John D. Rockefeller dedicated 45 miles of paved and unpaved carriage road within the park itself. You can rent a bike in town, then ride to a nearby road, like the one that circles Eagle Lake. You’ll be walking your bike uphill in spots, but once you’re surrounded by birdsong, most of the road surface is flat, fast, pleasant, and blissfully car-free. This diverse terrain offers real variety for trekking, from woodsy walks to scrambles up rockface — and even vertical iron rungs (I didn’t try that, but wish I had). Several of the hikes are named after their respective mountains: Champlain Mountain (Bear Brook Trail rises high above blue bay vistas), Beech Mountain (up a steep half mile up, then down a milder decline), Cadillac Mountain (both north and south approaches). What’s great is that you don’t quite know where a trail’s going to lead: I once summited bare rock, only to descend into a lush forest covered with pine needles. Make sure your shoes have good tread. I’ll never forget when my parents rousted me from bed one summer to watch the sunrise atop Cadillac Mountain. I fumed all the way up, then caught my first glimpse of brilliant orangeburst. Now that I’m older, it’s more of a choice to rise and drive at 4 a.m. And witnessing the awakening day head-on is still worthwhile — especially at 1,500 east-facing feet. At first glance, the resort town that anchors Acadia is just lobster and ice cream as far as the eye can see. And there’s nothing wrong with that. Once you’ve had your fill, visit Sherman’s Books and Stationery, a Maine-centric bookshop with great blueberry and shellfish cookbooks, Hush for women’s clothing and cards, and Spruce & Gussy for leatherbound journals and hand-made aprons. When we got to Bar Harbor too late for dinner, the townies all pointed us to Little A’s Sports Bar. The made-to-order pizza was great, and on Friday night, they had a karaoke host and a mongo list of songs. If you’re in the mood for cheese, this is a fun local alternative to the rowdier bars along Cottage Street and Rodick Place. Built in 2012, this hotel is a find: tasteful and accommodating, with a modern vibe, nautical touches, and total lack of kitsch. Our room faced Frenchman Bay and had a generous balcony where we took in the salt air over breakfast and heard strains of trivia from the embarking boat tours. The amenities are a hit, from a large lobby hearth to a rooftop mosaic infinity pool. 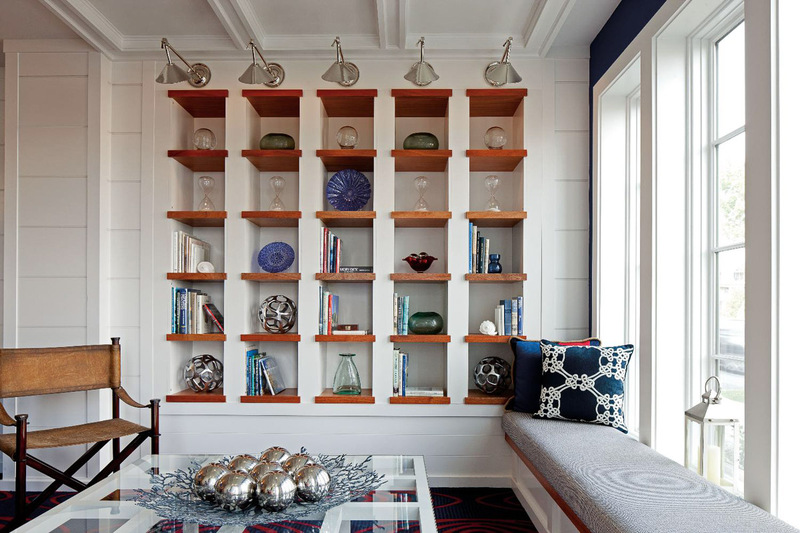 Every floor has a pantry thoughtfully stocked with bottled water, fruit, and board games. And after a strenuous hike, you can’t beat a massage jet rain shower for revival. Library in West Street Hotel. Adjacent to (and owned by) the West Street Hotel, with outdoor seating that faces Frenchman Bay, this pub takes its Irishness seriously. Remarkable server Jake Busker steered us away from the standard Maine fare (“good, but not what we’re known for”) to hearty rotisserie dishes made with a spit-roasting technique that originated across the Atlantic. I adored nearly everything that landed on our table: a chalk white, velvety seafood chowder topped with micro-herbs and basil oil, a tomato-fresh “farmer’s salad,” and a juicy pork “rack” with smoked bacon and bits of roasted butternut squash and apples. The homemade blueberry pie was a cute, personal-sized whole pie with a surprise tucked underneath: creamy lemon curd. Located right in the park on the halfway point on the 27-mile loop from the visitor center, you’ll need a summertime reservation to eat at this casual lunch spot. The air smells of cooked wild blueberries. Lobster rolls are buttery and lovely (if slightly understuffed), but the real draw are fresh-from-the-oven popovers. If you’ve never had a popover, it’s a cross between a muffin and a dinner roll, only hollow. Milk, eggs, and flour “pop over” the rim of the muffin tin to form a steaming dome of bread. Ask for the reserve blueberry jam. A cute, quirky, and popular spot for a hearty breakfast before tackling the trails. Standard breakfast fare includes a range of benedicts and omelets. In high summer, expect a line. Jacuzzi at Harborside Hotel and Marina. How to Get There: You could drive up the coast (a day from New York City, half-day from Boston) or fly into Bangor, rent a car, and drive 75 minutes southeast. Getting Around: It’s best to have a car, but it is possible to walk around town, rent a bike, and hop on the Island Explorer shuttle, starting in late June. When to Go: The park is open year-round, but spring, summer, and fall are great times to visit. Many of the Bar Harbor lodgings and attractions are closed until just before Memorial Day. Pack: Flannel and jeans. Sweatshirts and T-shirts. Cotton layers. Hiking shoes with excellent tread. Jean Tang owns MarketSmiths, a copywriting and content marketing agency. She also writes a column for Forbes about the pleasures of scaling a service business. You can follow her on Facebook and Twitter at @MarketSmiths. She travels for the fluffy hotel pillows.